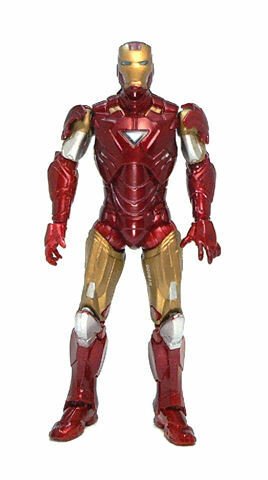 According to the movie series, the Mark VI Iron Man armor is the latest iteration of armored suits built by Tony Stark. 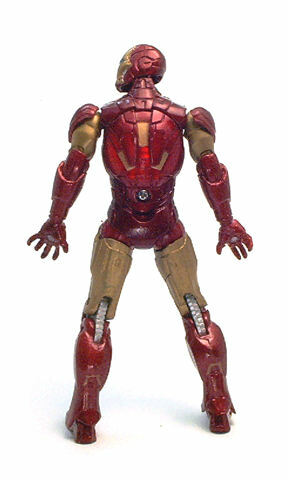 As such, it was featured prominently in the second movie and Hasbro followed suit by making not one, but two versions of this armor model for the first wave of figures in Hasbro’s Iron Man 2 toy line. 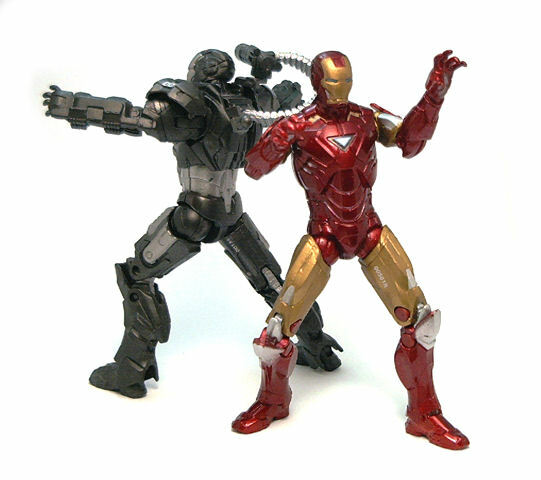 These figures are one regular super-articulated Mark VI armored figure and a light-up chest gimmick one. 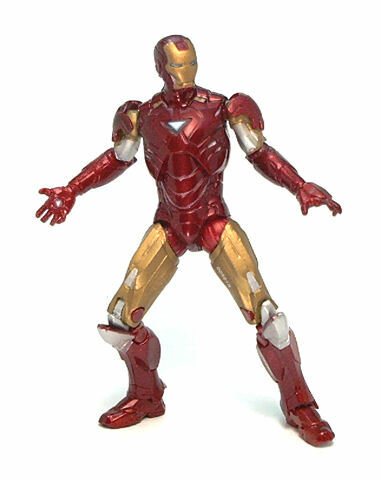 Today I’ll be focusing on the Mk.VI Iron Man Power Glow version while you can read the review for the regular figure here. As a matter of principle, I usually shun gimmick figures. In most cases these features are either hideous to look at or mess with the articulation in some way. 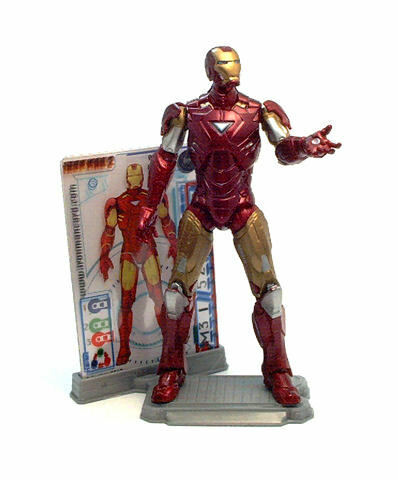 In the case of this Iron Man figure it is the later scenario but as it turns out, the end result is quite above tolerable in that regard. In terms of sculpture, the Mk6 is fairly consistent with the level of detail found on the other figures in the line. Some basic modifications had to be made to accommodate the action feature, but at a glance, there is not a lot to tell one version from the other. Structurally, the light-up version uses a new torso piece that lacks the torso joint in order to contain the led/battery array inside the figure’s chest. 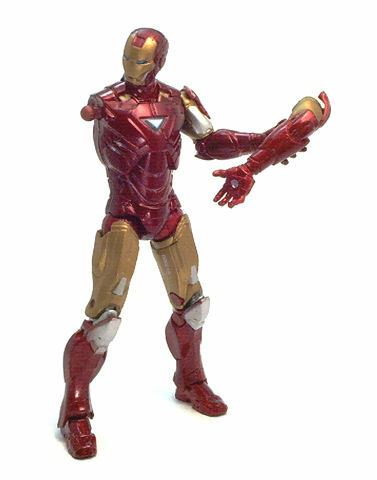 The action feature works by pressing down on Iron Man’s head, causing whole translucent red torso to light-up while contact is made. • Ball jointed neck: Despite being used as the action feature switch, it works perfectly and allows for both tilt and swivel in any direction. • Ball jointed shoulders: And I mean real ball joints here, thus lateral range is fairly limited but swivel is fine on both arms. • Peg & hinge elbows. • Peg & hinge ankles. I don’t really miss the torso joint nor mind the slightly restricted lateral shoulder range. In fact, the new neck joint picks up much of the slack from the fused torso and should I be inclined to, the shoulder range can easily be increased filing away a groove at the upper shoulder piece. The range on any of the remaining joints is comparable to that of the other movie style figures, meaning sometimes the character design does get a little in the way of some poses, but for the most part work just fine. One important thing I’d like to point out is that I had been postponing getting this figure for about six months. 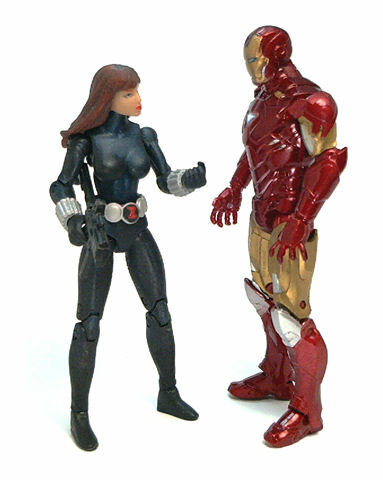 After the first few Iron Man figures I got, I started to grow tired of seeing row after row of these figures at the store sporting the same red/gold color scheme. What finally tipped me off to buy this figure was that in the third wave of figures, this one was repackaged with a paintjob similar to that in the Target Exclusive Hall of Armor figures. You can tell because this figure sports a much better paintjob than the first-run regular figures, starting with a much cleaner and consistent red paint application. The limbs now display silver paneling that is much more movie accurate and was missing on the original release. Also, the ARC reactor at the chest is painted over the same way as the non light-up figures, improving the look of this Mk6 Iron Man when the action feature is not used (which amounts to about 99.99% of the time). Supposedly, these running changes also apply for the regular version of the Mk.VI, although I have not been able to find one yet. Since this time the gimmick is part of the figure itself, we don’t get a spring-loaded launcher of any sort, even though we still get the nicely sculpted techno-grill display base and the corresponding trio of armor cards. In a nutshell, this is a pretty good figure to add to my collection, and one I’m glad I hadn’t picked up earlier.